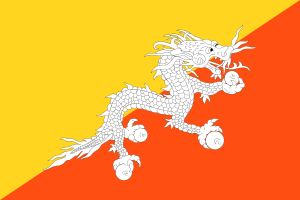 Lepcha language, or Róng language (Lepcha: ᰛᰩᰵ་ᰛᰧᰶᰵ; Róng ríng), is a Himalayish language spoken by the Lepcha people in Sikkim and parts of West Bengal, Nepal and Bhutan. The Indian census reported 50,000 Lepcha speakers, however the actual number of native Lepcha speakers in India may be closer to 30,000. Roger Blench suggests that Lepcha may have an Austroasiatic substratum, which originated from a now-extinct branch of Austroasiatic that he calls "Rongic". Retroflex phonemes /ʈ/, /ʈʰ/, and /ɖ/ are written in Lepcha script as kr, hr, and gr, respectively. Most, though not all, instances of retroflex consonants indicate a word is of Tibetan origin. To distinguish this retroflex sound in Lepcha script, a dot may be written underneath. Native instances of non-retroflex kr, hr, and gr may be pronounced either as written or as ⟨tr⟩, ⟨thr⟩, and ⟨dr⟩. For example, tagrikup, "boy," may be said either [ta ɡri kɯʔp̚] or [ta ɖi kɯʔp̚]. Lepcha has three glide consonants that may occur after certain initial consonants: /r/, /j/, and /l/. When the phoneme /r/ operates as a glide, it can combine with /j/ as a double-glide: mryóm, "to spread over the ground, creep." Notably, syllables with the glide /l/ are given their own independent forms in the Lepcha script. Many Lepcha nouns can be grouped into one of several classes based on associated characteristics. For example, many animal names begin with the Lepcha script syllabic /sâ/: sâr means "goat," sâryom means "otter," sâlók means "rhinoceros," and sâhu means "monkey." Other noun classes include /sâ/ and /ka/ for plants, and /pe/ or /pâ/ for snakes and bamboo products. Many intransitive verbs incorporate a causative -/y/- infix, sometimes followed by a -/t/ suffix, to take a transitive sense: mák, "die" → myák, "kill;" plâ, "come forth" → plyâ, "bring forth;" glú, "fall down" → glyat/glyet, "drop." 1 2 3 4 5 6 7 8 9 10 11 12 13 14 15 16 17 18 19 20 21 22 23 Plaisier, Heleen (2007). A grammar of Lepcha. Tibetan studies library: Languages of the greater Himalayan region. 5. BRILL. ISBN 90-04-15525-2. ↑ Hammarström, Harald; Forkel, Robert; Haspelmath, Martin; Bank, Sebastian, eds. (2016). "Lepcha". Glottolog 2.7. Jena: Max Planck Institute for the Science of Human History. 1 2 3 4 5 "Lepchas and their Tradition". Official Portal of NIC Sikkim State Centre. National Informatics Centre, Sikkim. 2002-01-25. Retrieved 2011-04-16. ↑ van Driem, George (2001). Languages of the Himalayas: An Ethnolinguistic Handbook of the Greater Himalayan Region. Brill. ISBN 90-04-12062-9. ↑ Coulmas, Florian (1996). The Blackwell Encyclopedia of Writing Systems. Blackwell. ISBN 0-631-21481-X.